Viewing 24 of 531 items. 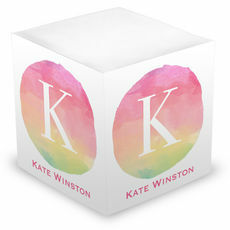 Includes a top line of upper/lowercase text plus up to 10 uppercase names or phrases up the side. 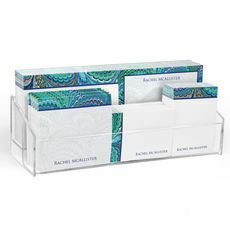 Set of 260 sheets with crystal clear acrylic holder. Size 4.5" x 8.5". Flat printed in your choice of.. 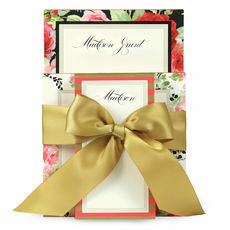 These modern and trendy foldover note cards are perfect for your thank you notes to friends and family. Flat printed in typestyle and ink color only as shown. Size 5.5" x 4.25". 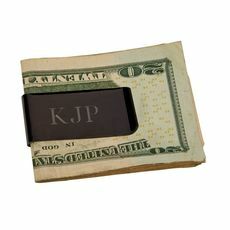 Blank white envelopes..
Our most popular money clip shape but done in a black, gun metal finish. The non-tarnishing gun metal clip is 2" long by 1" wide. Money not included! Typestyle, format & positioning.. 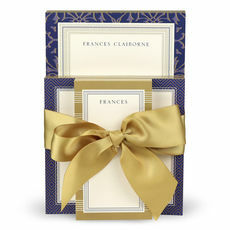 These modern and elegant foldover note cards are perfect for your thank you notes to friends and family. Flat printed in typestyle and ink color only as shown. Size 5.5" x 4.25". 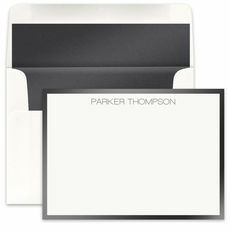 Blank white envelopes..
Set of 1250 Post-it® sheets on 25 pads with flat printing in ink as shown. Pads Included are: • 5 - 4"x3" pads with adhesive on 4" side • 5 - 4"x3" pads with adhesive on 4" side • 5..
A colorful set of notepads with a total of 600 sheets. 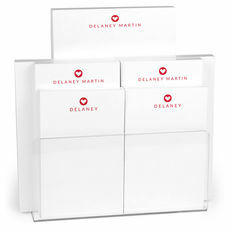 Set of 6 notepads each with 100 sheets per notepad. 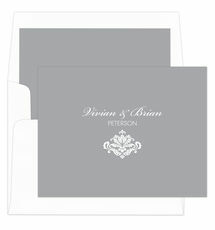 The sizes include: 2 pads that are 3" x 4"; 2 pads that are 4" x 6"; and..
Our Precious Metal Hand-Bordered Note Cards feature a shimmery border in edgy titanium metallic ink to make your holiday gifting shine bright. 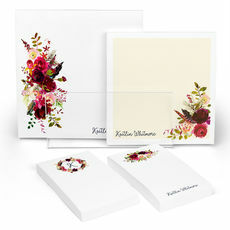 Set of 25 Personalized Flat Note Cards 6.25" x..
A beautiful fall themed set of notepads with a total of 600 sheets. 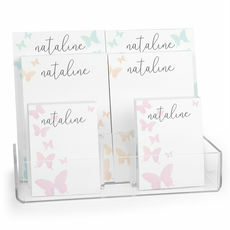 Set of 6 notepads each with 100 sheets per notepad. 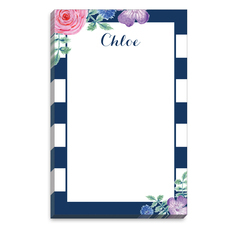 The sizes include: 2 pads that are 3" x 4", 2 pads that are 4" x..
Modern yet soft and feminine, this on trend design will add a delightful touch to your note writing. Notepads size is 5.5" x 8.5" and contains 100 sheets per pad. 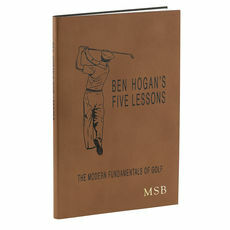 Flat-printed in ink color and..
A timeless classic, Ben Hogan’s Five Lessons outlines the building blocks of winning golf from one of the all-time masters of the sport—fully illustrated with drawings and diagrams to.. 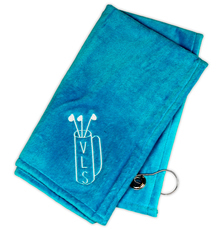 The perfect accessory for your favorite golf bag. Size of towel is approximately 15" x 26". Made from your color choice of 100% cotton terry velour. Hook and grommet in corner is included as..
Grandparent's Day lets you show your grandparents that you love and care about them and that you appreciate everything they've done for you over the years. With our wide selection of personalized Grandparent's Day gifts, you'll find something special for your favorite family members. 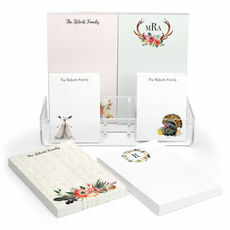 At The Stationery Studio, it's fun and easy to give your grandparents the gift of personalized cards. 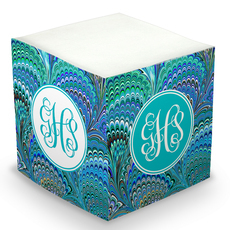 We offer different designs that you can personalize with their names, address or just a simple monogram on the front. 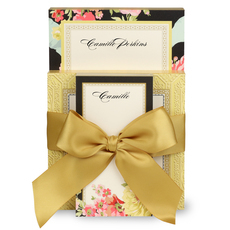 Grandparents may also love simple note cards and notepads that they can use at home. You can even personalize your choice with an image of you and your grandparents. All our note cards and pads are made from high-quality paper. Along with some traditional gift ideas, we encourage you to get creative and personalize popcorn bowls, sets of playing cards,bridge pads or wood cutting boards. Personalized and sturdy canvas tote bags can help them transport groceries from the store to home and weekenders are fabulous for traveling. Our canvas totes and bags are designed with strong leather or canvas handles for a sturdy grip. Larger bags provide them with room for all their travel belongings while our smaller bags are perfect for overnight trips and jaunts around town. Monogrammed phone cases, laptop sleeves and tablet sleeves are great for tech-savvy grandparents. 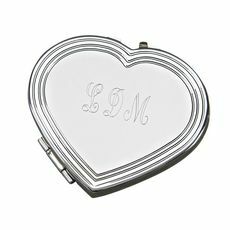 We offer various colors, sizes and designs to fit products from the top manufacturers, and you can customize each one specifically with your grandparents' names. A great set of Post-it® Notespads they can keep by their phones are a welcomed gift idea to help them always have a small piece of paper handy. And with a Post-it® , they can easily stick the message somewhere in easy view to remember the details needed. 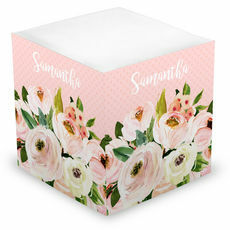 So, whether it's a paper product, a personalized candle, a set of triple-milled, 100% vegetable-based warm white soaps which are handcrafted in Vermont, personalized luggage tags, or a quality etched vase you can fill with pretty flowers, your grandparent's will certainly feel appreciated and loved.